Reference number for this case: 1-dec-54-Chaumont. Thank you for including this reference number in any correspondence with me regarding this case. 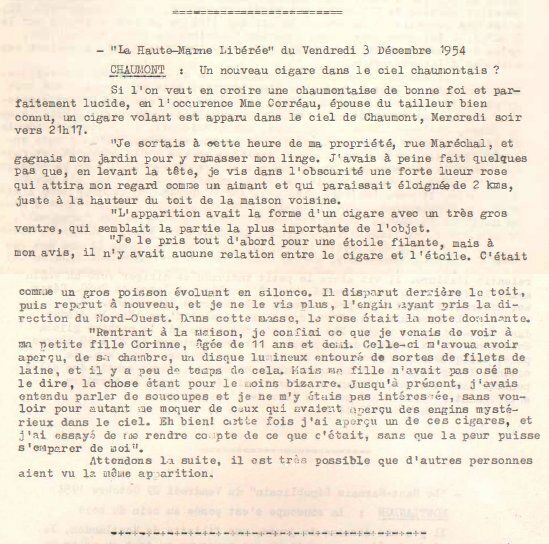 The regional newspaper "La Haute Marne Libérée", of December 3, 1954, reported about an observation in Chaumont, the Haute-Marne, at approximately 09:17 p.m., on Wednesday, December 1, 1954. The witness was a female resident of Chaumont, considered to be "of good faith, perfectly lucid", the wife of the well-known tailor. "At this hour I came out of my property on Maréchal street, and reached my garden to collect my linen there. I had hardly taken some steps, that while looking up I saw in the darkness a strong pink gleam which attracted my glance like a magnet. It appeared distant of 2 kilometers, just at the height [elevation] of the nearby house." "The appearance had the shape of a cigar, with a very large belly that seemed the bigest part of the object. I first of all thought it was a shooting star but, in my opinion, there is no relation between the cigar and a star. It was like a big fish moving in silence. It disappeared behind the roof, then reappeared again and I dis not see it any more, the machine having taken the NW direction. A pink color was the dominant color." "Returning to the house, I entrusted what I had just seen with my young daughter Corrine, 11.5 years old. She acknowledged to me that she saw from her bedroom, a luminous disc surrounded by kinds of wool nets, a short time ago. She had not dared to tell it to me, the thing being at the very least odd." "Until now I had heard speak about saucers and I had never been interested in this, without wanting however to scoff at those who had seen one of these cigars and I tried to understand what it was." As for me, I think this is strongly similar to one or more noctilucent clouds. If one wants to believe a resident of Chaumontoise who has good faith, perfectly lucid, wife of the well known tailor, a flying cigar appeared in the sky of Chaumont, Wednesday evening December 1st at about 09:17 p.m.
"At this time I left my property on Maréchal street, and gained my garden to collect my linen there. I had hardly taken some steps, that as I was looking up I saw a strong pink gleam which attracted my glance like a magnet in the darkness. It appeared distant of 2 kilometers, just at the height of the next house. The appearance had the shape of a cigar, with a very large belly which seemed the most important part of the object. I first of all took it for a shooting star but, in my opinion, there is no relation between the cigar and the star. It was like a big fish moving in silence. It disappeared behind the roof, then reappeared again and I did not see it anymore, the machine having taken the Northwestern direction. A pink color was the dominant color. Returning to the house, I entrusted what I had just seen to my young daughter Corrine, 11 1/2 years old. She acknowledged to me to have seen, from her room, a luminous disc surrounded by sorts of wool nets, little time ago. She did not dare to tell it to me, the thing being odd at the very least. Until now I had heard talks of saucers and I had never been interested in this, without wanting to ridicule those who had seen one of these cigars and I tried to understand what it was". Let's wait for a follow up, it is very possible that other people saw the same appearance. CHAUMONT: A new cigar in the Chaumont sky? If one wants to believe a female resident of Chaumont of good faith, perfectly lucid, wife of the well-known tailor, a flying cigar appeared in the sky of Chaumont, Wednesday evening 1st December at 09:17 p.m.. I was going out at this hour from my property in the Rue Maréchal, and was going to my garden to pick up my linen; I had scarcely taken a few steps, when, looking up, I saw in the darkness a strong pink glow. It caught my eye like a magnet, it looked like being two kilometers away from the next house. The apparition had the shape of a cigar, with a very large belly that seemed to be the most important part of the object. I first took it for a shooting star, but in my opinion there was no relation between the cigar and the star. It was like a big fish moving in silence. It disappeared behind the roof, then reappeared and I did not see hit anymore, the craft having taken the NW direction. Coming home, I confided what I had just seen to my little daughter Corrine, aged 11 1/2, who told me she saw from her bedroom a luminous disc surrounded by wool, not long ago, she had not dared to tell me, the thing was weird to say the least, so far I had heard about saucers and I had never been interested in all that, I did not want to make fun of those who had seen one of these mysterious machines in the sky, and this time I saw one of these cigars, and I tried to find out what it was without that fear can seize me. Chaumont (52) December 1st, 1954 - 09:17 p.m.
"I was going out at this hour from my property in the Rue Maréchal, and was going to my garden to pick up my linen; I had scarcely taken a few steps, when, looking up, I saw in the darkness a strong pink glow. It caught my eye like a magnet, it looked like being two kilometers away from the next house. A pink color was the dominant color. Coming home, I confided what I had just seen to my little daughter Corrine, aged 11 1/2. She told me that she had seen a luminous disc surrounded by woolen threads from her bedroom a short time ago. She had not dared to tell me, the thing being odd to say the least. So far I've heard about saucers and I've never been interested in it without wanting to make fun of those who had seen one of these cigars and I tried to realize what it was." Waiting for more information, it is very possible that other people have seen the same appearance. La Haute Marne Libérée December 3, 1954. NOTE - This information comes from the archives of Jean Charles AZZOPARDI and was published in the bulletin #1 of February 1980 of group 52-55. Archived by Mrs GUEUDELOT. Luc Chastan indicates that in the Haute Marne, in Chaumont, on December 1, 1954 at 21:17 hours, a woman went to pick up the linen in her garden on street marshal. A strong pink gleam attracted her glance in the black night. It appeared to be 2 km away. The shape was like a cigar with a very large belly. The object disappeared behind the roofs in the direction of the Northwest. The source is indicated as Lumières dans la Nuit issue 259/260. The pink color, the shape, the "filamentous" aspect evoked by the daughter (idf she saw the same thing), the hour, all makes me think that it was probably one or more noctilucent clouds. Noctilucent clouds are made up of ice particles in the upper atmosphere that get visible at dawn or dusk because the sun's rays illuminate them, causing them to appear as strange luminous masses, with orange, pink or red hue. Above: Simplified figure with exaggerated proportions of the cause of noctilucents clouds. The reason I doubt it was a meteor is that there was only one report, apparently. [hm1] Article in the regional newspaper La Haute Marne Libérée, France, December 3, 1954. Article in the bi-yearly ufology bulletin of the "GROUPE 5255" ("Groupe d'Etude et de Recherche sur les OVNI Haute Marne / Meuse"), Chaumont, France, #1, February 1980. [fl1] "De l'inédit dans nos archives de 1954 et 1956", article by Fernand Lagarde, in the ufology magazine Lumières Dans La Nuit (LDLN), France, #259-260, page 43, January - February 1986. 0.1 Patrick Gross October 3, 2007 Conversion from HTML to XHTML Strict. 1.0 Patrick Gross December 26, 2008 Conversion from HTML to XHTML Strict. First formal version. Additions [lc1]. 1.1 Patrick Gross December 1, 2016 Addition of the Summary. Explanations changed, was: "Not looked for yet". 1.1 Patrick Gross November 30, 2018 Additions , [fl1], [lh1]. In the Summary, removal of "The case does not seem to have interested anyone, except for Luc Chastan who included it in his 'Base OVNI France' web database in the 2000's." In the Explanations, addition of "The reason I doubt it was a meteor is that there was only one report, apparently."